One of the many benefits of a career in Code enforcement: Watching the seemingly worthless PvE'ers of highsec begin to blossom. Another benefit: Rock star status. Agent Bob the Fourth and his bumper alt, Bob the First, have become a source of guidance and purity in the Solitude region. However, not everyone likes guidance and purity. The appropriately named (and inappropriately behaved) MiC Lawless attempted to gank our hero. Can you guess what happened? Probably. Agents of the New Order always win. Always! Miner bumper Bob the First easily shrugged off the attack. The silly miners who say ganking is easy and risk-free never manage to do it successfully. 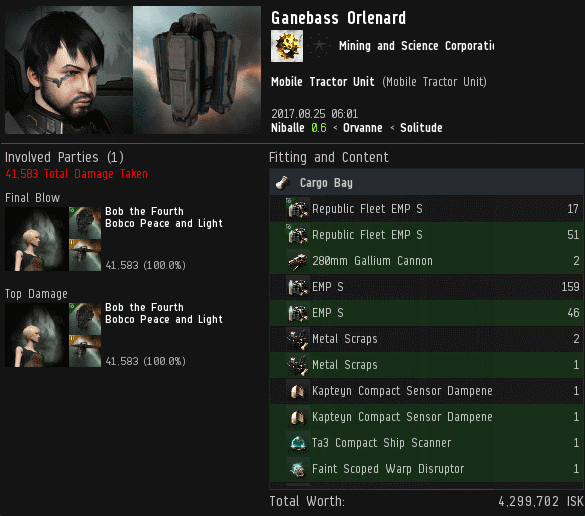 They must assume that everything in EVE is as simple as AFK mining--otherwise they'd have to admit that they lack skill. Nevertheless, when a miner tries to gank an Agent, at least the miner isn't mining. Bob congratulated MiC Lawless on his attempt to play EVE for the first time. The combat experience seemed to perk him up. 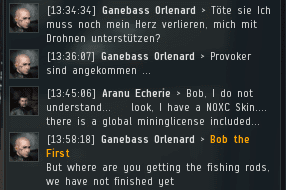 Maybe Bob was getting somewhere with this miner? Over the next few days, things took an unexpected turn. The miner's failed gank attempt gave Bob a kill right on him. Bob periodically activated the kill right, forcing MiC Lawless to dock up. 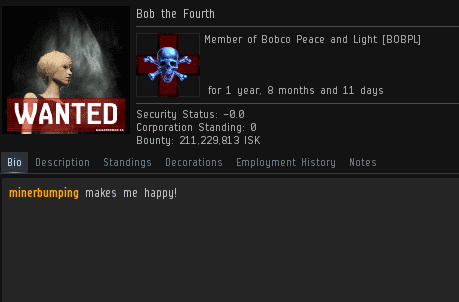 The miner got so tired of this that he declared war against Bob's corp. At least then they'd be on a level playing field. In his generosity, Agent Bob set the war to "mutual" status so that MiC Lawless would no longer need to pay to renew the war each week. It also meant that the war would continue indefinitely. Eventually, MiC Lawless realized that there's no such thing as a level playing field when dealing with an Agent of the New Order. Of course MiC Lawless didn't stand a chance against our Agent--what was he thinking? The miner decided to go AFK for the next several weeks while the kill right expired, and then he retracted the wardec. An entire month's worth of mining time was lost. Bob was happy to teach MiC Lawless a lesson. The miner wasn't his only student, though. Bob, an enthusiastic teacher, taught the miners of Solitude about Mobile Tractor Units. Unlike most things related to highsec, MTUs can be destroyed without summoning CONCORD. Bob demonstrated this by attacking every MTU he could find. Sometimes the same miner needed to learn this lesson repeatedly. Bob eventually attracted the attention of Ganebass Orlenard, who was tired of losing his MTUs. Ganebass had something important to tell Bob, but he had trouble expressing it. Despite the language barrier, Ganebass eventually got the message across: He had a score to settle with Bob. The always well rehearsed Wolf everyone give him a hand so he can choke a miner. "I think you should leave your beast alone." Least he go blind? I loled, looks like Agent Bob is skilled in verbal pvp also. Hisec carebears are simply outclassed when it comes to dealing with Gankers. Outclassed? Don't they have to go to class first t have any class? I suggest the school of the dead, Egypt use to call them mystery schools, perhaps they could get wrapped up in some studies before being buried by some code. We know but its more fun to spring it. James315 continues to make carebears in Albion upset! Boring, lets get back to killing. Although I do love the sound of a good sharp blade. Perhaps its time to make my mark on the people in albion. Leaving scars is better than blown up wrecks. More personal too. I like that a miner at least tried to gank an Agent. Props for that. Happens a lot, they always fail let me know when one actually stacks a body then we can maybe toast him, till then lets just make him toast. Oh indeed, they must all be salt miners. When you blast them there is nothing but salt. Perhaps we should call them shakers instead.